My Spotlight Series continues with highlighting Hopie Avery, editor of The Scout Guide's Raleigh/Durham/Chapel Hill edition. The Scout Guide is a boutique publication (and road map of sorts), featuring the best of local business in each participating city. I've written previously about TSG here, but today's post dives a little deeper into more about Hopie and her work with TSG. My Q&A below.... *FYI, Hopie and I were classmates together at Sweet Briar. I believe you're currently based in Durham, North Carolina.... How long have you lived there and are you from the area originally? Yes, we have lived in the Triangle area since 2007—we spent 2+ years in Chapel Hill while my husband was in business school and the rest in Durham. I spent most of my childhood in Greensboro and originally my family is from points more east in North Carolina. I moved away in 1990 to go to college in Virginia and moved around from there. I lived in NYC for 11 years and two in San Francisco! The scales are tipping back to being a true North Carolinian again—for a time it was that I spent more time out of state than in…. We have a connection through college years shared in Virginia..... But post-college, I think you might have been in NYC working in a design field for a while before returning to NC? Yes! Holla Holla, oh Sweet Briar! (a college cheer!) I graduated from Sweet Briar in the mid 90s with a degree in Studio Art and Arts Management. I had no idea what I wanted to do, ok, I did, but my liberal arts education was maybe a little more liberal than putting me directly on that path. I absolutely knew I wanted to live in New York City since my first trip at age twelve and through a dear college friend, I got an interview in the Design Department at Tiffany & Co., long story short, I coordinated design projects for Tiffany designers and eventually started taking on the projects myself. Tiffany & Co. had a great continuing ed program and I would take design classes at SVA, Parsons and FIT. I also learned tons from my wonderful co-workers on the job. It was really incredible, everyone was so talented, from re-design of the MLB/ World Series Trophy to hand drawing beautiful numerals for timepieces… Oh! And the Super Bowl rings that would come through the office- so fun to try on rings that NFL players would wear- practically a bracelet! Eventually I saw an opportunity to work at Gap, Inc. at their Old Navy brand, a perfect combination of cheap and cheerful, mixing high/ low and ultimately in fashion, my first design love….. There I designed accessories and grew their footwear business to beyond just flip flops. I handled categories from socks, eyewear, jewelry, hats, gloves + scarves with shoes being my first love and focus. Why was The Scout Guide established and who are the founders? 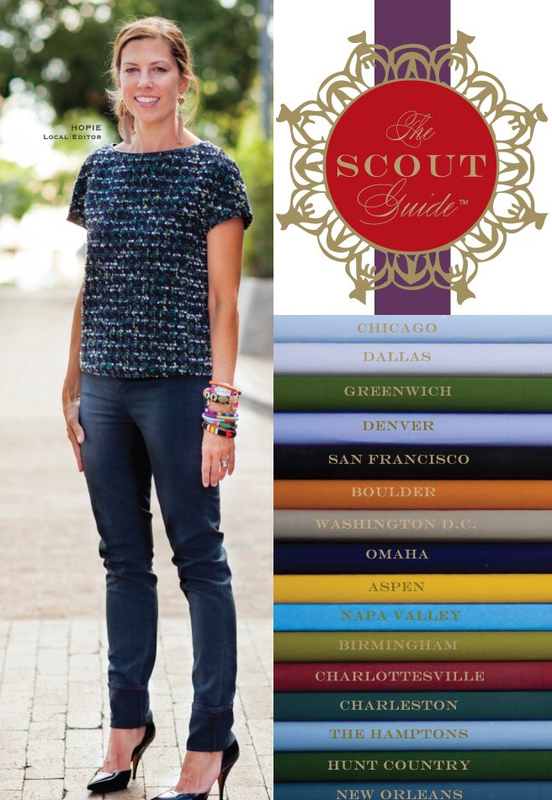 The Scout Guide was started as a local blog in Charlottesville by Susie Matheson and Christy Ford. Charlottesville is a wonderful university town nestled in the foothills of the Blue Ridge Mountains and has a vibrant local scene that has grown over the past ten years. I think they saw that their beloved, awesome local businesses did not get a fair shake in representation in their local publications. Christy’s background is in photography and they saw a need to make, really, a locals-only publication that did not have to compete against national chain marketing budgets and presented images as compelling as the businesses that they represented. They realized that while the local businesses offered different products and services but were all relevant to each other in that they have the same customer. The first year they produced two editions of The Scout Guide and quickly learned that their beautiful publication had an even longer shelf life and publishing it annually made the most sense. How did you come about being offered the position of TSG editor? I learned about Scout via my father in law. He brought home a copy from his med school reunion at UVA, knowing that I would completely appreciate this beautiful publication. Immediately I loved it, I was completely captivated and it spoke to me. I kept my eye on Scout and eventually saw that they were expanding. I reached out to them and it made sense to bring it to the Triangle. My experience in design and love of “finds” and local made sense for me to hop on board. How long have you been editor? Are you solely responsible for each issue? How many times a year are the issues published and where can people find an issue? I have been editor since May 2012 and am presently working on Volume 3 for the Triangle. I am solely responsible for each issue—with some help of course! I work with an enormously talented photographer, Nick Pironio and The Scout Guide has a design team that is great to work with. I love working on Scout because it harkens my design days at Old Navy of having full reign of putting designs into work with my vision and also my history at Tiffany & Co. of channeling that fine, old school appreciation of more traditional, hand wrought, precious items. Does that make sense?! Scout is published annually and my edition comes out each Fall (it’s different for each market, depending on their needs and when they began the cycle). The Scout Guide is available at all the businesses in the book and as well as hotels, local shops,“foodie” establishments, realtors, galas, really any place that I see as a good fit. I enjoy personally placing the book so I make a connection and ensure good placement. I follow your active schedule for TSG through social media.... Give me an overview of what a typical day for you is like. Is there any upcoming news on the horizon for you personally and/or for TSG in 2014? Oh, lately people have been asking if there is ever an “Editors Conference” and for the first time this spring there is, I am really excited to head to Charlottesville at the end of the month and meet fellow Scout Editors-- I have met a few on occasional trips, but think it will be really great to connect with like minded people who have embarked on this adventure with Scout! I will keep you posted…!